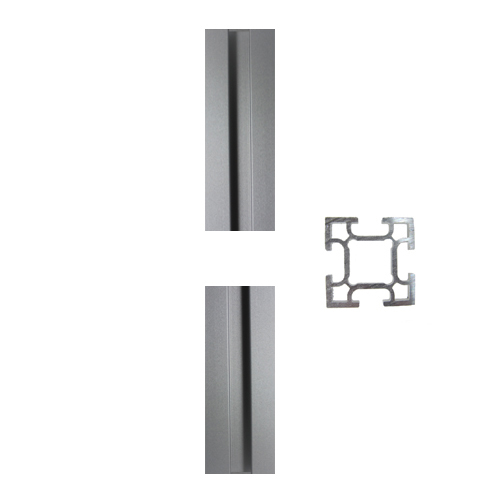 Lengths of exhibition frame profile in satin anodised aluminium - 32mm square satin anodised aluminium profile, with fixing grooves along all four faces. Choice of fixings (see below) are available. PLEASE USE THE DROP-DOWN BOXES ABOVE to view different option for this item (eg by altering the 'profile ends'). The lengths of profile have 8mm grooves running down them which can be used to hold a rigid panel up to 8mm thick, or with various fixings. These are attached to both ends of a length of profile using a grub screw and are supplied already attached. They fit into the grooves on further lengths to allow a length of profile to be locked in securely between two others. An allen key is provided with each order. These are secured into the end of a length of profile using an M5 screw and are supplied already attached. An M6 screw (also supplied) can be used to secure, for example, a base plate or a table top to the end of the profile. These tap in to the end of a length of profile. They are supplied loose. These push in to the end of a length of profile for a neat finish. They are supplied loose. All fixings are also available separately.